Thinking the Unthinkable: What if China Devalues the Renminbi? Conventional wisdom holds that the Chinese are due (as in overdue) for a revaluation of their currency, the renminbi. For instance, a recent report from Goldman argues that China will raise the value of the RMB against the dollar by 5% this year. The argument is that the move is needed to slow down an overheating economy. But to a large degree, whether you agree with that as a remedy depends on what one’s reading is not just of China’s notoriously misleading statistics, but of the underlying growth dynamics, which are well out of bounds of any previous pattern, and not in a good way, either. We question whether a revaluation is the right answer for them, and more important, whether the Chinese themselves see a revaluation as a plus. The government has engineered an enormous increase in money and credit in the past year. In fact, it seems to be as great as 5 years’ growth in credit in the previous Chinese bubble. The increase in money and credit is so great and so abrupt that you tend to get a high inflation quite quickly even if there are under utilised resources. Add to this the fact that China simultaneously is providing massive fiscal stimulus. This combination is the making of a very messy situation. If China seeks to sustain demand via fiscal policy, the result is likely to be a big inflation problem. With many Chinese students steeped in Chicago School monetary theory coming home and assuming positions of authority, they could push for an aggressive, Paul Volcker-style effort to stop inflation. But, what if the they don’t? Inflation can take off and thereby begin to ERODE the competitiveness of Chinese exports. Nouriel Roubini pointed out this issue in 2007: if China didn’t revalue, inflation would do the trick regardless. A continued high rate of inflation relative to its trade partners would push up the price of goods in home currency terms, which in turn translates into higher export prices. This might be the real reason why China is so reticent to revalue its currency. The Americans might go crazy if the Chinese devalued, but if the inflation is high enough, they might have to do it, as it will severely erode their terms of trade and cause their tradeables sector to collapse. Or the hard-line monetarists triumphing by fighting inflation and the result is riots as unemployment increases. It could get very ugly. This could be happening now in China, although this is the opposite of prevailing views. The consensus is that inflation is a couple per cent and even that is largely due to higher pork prices thanks to a lousy corn harvest. However, economists such as those at Lombard Street in the UK, Jim Walker, Simon Hunt and the like try to figure out the changes quarter to quarter in Chinese nominal GDP which is reported only year on year. And they come up with giant double digit growth rates for the second half of last year. Now this is complicated by the fact that the Chinese have revised up their GDP numbers and they put all the revisions into the final quarter of the year. But when these analysts try to adjust for that statistical screw up they still come up with giant nominal GDP increases. Lombard Street thinks it was twenty five per cent or so in the second half of last year. They think it was twenty per cent real and five per cent inflation. Economies of any size never grow at a twenty per cent real rate. And Simon Hunt says if you look at proxies like power output and rail traffic you don’t get those kinds of numbers for real growth, which suggests that inflation must be higher than four or five per cent. In general, if a real GDP figure looks sus, the first figure you examine critically is the GDP deflator. So some evidence suggests that China’s inflation could already be at a double digit level. It is hard to say. But if it is that high, then the resultant inflation will cause a real revaluation of the trade weighted exchange rate. And more so if the dollar rallies. That could well crush the volume of exports and the profitability of the industrial tradeables sector. Exports are the only area where China makes any kind of money because they can sell these products for about 10 times what they obtain for a comparable product in the domestic economy (where profits are virtually nil). The export sector is a big contributor to overall super excessive fixed investment in China. Dollar appreaciation means foreign direct investment will go to zero net. There will be strong forces for a reduction in fixed investment in this large sector. Hence, there is a good chance that even without monetary tightening by the Chinese authorities, the overall fixed investment boom in China will turn down. The email noted that, on my logic, no developing country could ever suffer from overcapacity until it became rich and that the world should never have suffered a Great Depression in 1929. Since that salutary critique, Yu has elaborated further on his views. He believes China is trapped in a cycle where constantly rising growth in investment is constantly increasing China’s supply, but consumption has conspicuously failed to grow fast enough to absorb it. And so China is forced to increase investment in order to provide enough demand to absorb the previous round of increased supply, thus creating ever-widening cycles of oversupply. From 2005 China’s overcapacity problem had been “concealed” by ever-increasing net exports – but that strategy was interrupted by the financial crisis. Then came last year’s globally unprecedented stimulus-investment binge, which might not have been so worrying if it were delivering things that people needed. But the Government’s hand in resource allocation has grown heavier since the crisis without reforms to make officials more responsible for what they spend. “As a result of the institutional arrangements in China, local governments have an insatiable appetite for grandiose investment projects and sub-optimal allocation of resources,” as Yu previously said, in his Richard Snape lecture for the Productivity Commission in November. So there are now airports without towns, highways and high-speed railways running parallel, and towns where peasants are building houses for no reason other than to tear them down again because they know that will earn them more compensation when the local government inevitably appropriates their land. Reducing investment and exports could create a severe recession in China. China has gone too far this time. They appear to be in a box that they and others don’t recognize. 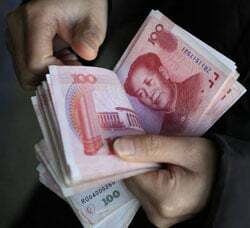 The “Black Swan” event this year, as far as China true believers are concerned, could well be a devaluation of the RMB. Were that to happen, the political consequences could be as significant as the economic.